Back when we had pigs, we were popular with surplus food people because we would take the raw and cooked meat as well as stale bread and veg. Since we had six dogs, we were thrilled to get it. We also fed the dogs when animals would die, like stillborn lambs. We never had enough raw meat to feed them fulltime, but we tried. This time, however we’re seriously trying to completely switch. Raw feeding was one of my goals in getting the rabbits, actually. Maybe next summer we’ll get enough kits to try it. However, we’ve had a couple of events that let us look over the territory in a serious way at a price we could afford. First, I found a mini-rabbit breeder down in Peterborough who was cutting down on her flock. There were 44 of them for a dollar a piece. Second, we’ve known for years that our dogs insist on plucked chicken, and really prefer it either cooked or frozen. If you give them a bird with feathers still on it, they tell me about the dead bird problem that we seem to have. “Hey! There’s a dead bird here. Something’s wrong!” Given the size of our cockerels, that was more work than they seemed to be worth. However, this year, we’ve been using the Small/Beginner Farmers of NH’s poultry processing gear. We bring it home for turkeys or waterfowl, and as long as it’s here, we can run any number of cockerels through the drum plucker and into the freezer. Because Lisa sold a bunch of started pullets this spring, we have lots of extra cockerels. Anyway, I brought the bunnies home, and poor Frank learned how to broomstick a rabbit. Disa, Gaela and Buffy got with the program immediately. After a little experimenting, we learned that the rabbits did not need to be skinned, but should be cut in half. Buffy got a whole rabbit, Disa and Gaela, a half each. We alternated front and back halves to each dog, all intact innards. By the time they were a month old, the puppies got their own half-rabbit to share. Maggie was a problem. She did not want a rabbit, period. She buried them, guarded them. She did NOT eat them. She loves beef and pork, but rather than eat rabbit, she tried to live on bird grain. This did not work. She was starving with dead bunnies in front of her. 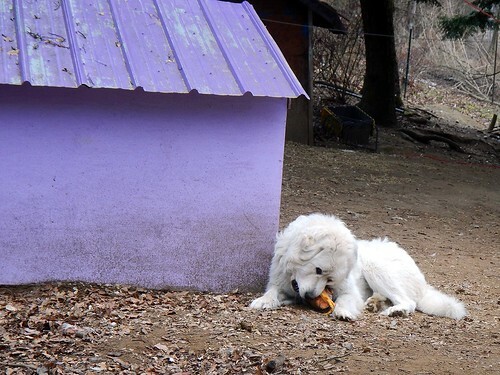 Her paddock was also becoming impossible for the other dogs to even come near, because of all the guarding behavior. So we caved, and went back to kibble for her, gave her buried treasures to the other dogs. We haven’t even tried to give her cockerel. She lives with the chickens, who are freaking cannibals. We don’t need mad chicken disease. One observation: Contrary to the “whole prey” people, our dogs totally eat the digestive tract. The pups in particular would steal intestine from their mom preferably to muscle. It’s really interesting to watch the puppies with a carcass. All of that tugging usually done with toys clearly comes from the instinct to dismantle one for food. They learn to share really well. In the beginning, Disa wouldn’t let them have any at all. She’d bare her teeth and snap at them, and they’d pick up scraps that she left. Then she started breaking off pieces for them, and the puppies would work together on it, shredding it. They’ll grab a piece and chase each other around with it. I don’t get anyone with food aggression issues this way. 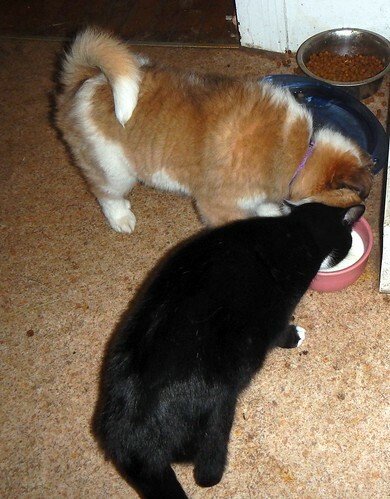 They also share with the cat, Tara. She’s often part of hunting parties with the dogs. They are great mousers, the lot of them, and they do indeed eat their prey. You catch it, you eat it. That’s my theory. Tara often helps them get critters out of trees, and she comes down for her share of the hunt, which they give her. Great team work. So I shouldn’t be surprised that she shares the raw meat as well, but it still does surprise me. Princess-kitty is so aptly named. Her food comes from her favorite can, thank you very much. We also have raw milk out ever since Disa had the puppies. They all love it. As do I! How old is Her Highness now?